Whether you're an international visitor or an Australian looking to discover your own nation, if you're planning a rail journey in Australia, a Rail Pass might be right for you. Buy a rail pass, then use it book your seats. All travel is in economy class seats, but you can update to first class and sleeping berths by paying a supplement when booking. This rail pass will enable you to make a one-way journey up or down the North East Coast of Australia on Queensland Rail trains between Cairns and Brisbane. It allows you to break your journey and stop over multiple times over the validity period, but you cannot backtrack. The pass is only available for purchase by bona fide overseas visitors to Australia, including international visitors on working holiday and student visas. The Queensland Explorer Pass allows unlimited travel across the Queensland Rail long distance network in any direction and as often as you like over a one or two month period from the first day of travel. Travel in an economy seat to Cairns & Tropical North, Townsville & Magnetic Island, the Whitsundays, Capricorn Coast, Hervey Bay & Fraser Island, Noosa & the Sunshine Coast, Brisbane, Gold Coast and Longreach & the Outback. The pass is only available for purchase by bona fide overseas visitors to Australia, including international visitors on working holiday and student visas. The Discovery Pass gives you unlimited economy travel on all NSW TrainLink Regional train and bus services for 14 days, one month, three months or six months. NSW TrainLink services connect Sydney to Melbourne, Brisbane, Canberra and cities and towns right across New South Wales. The Discovery Pass is available to Australian Residents as well as international visitors. SEEQ card is TransLink's electronic travel card for visitors to South East Queensland. It is the easy way to travel and explore South East Queensland. Travel 3 or 5 consecutive calendar days on all TransLink bus, train, ferry or tram services. Includes 2 journeys on Airtrain services to anywhere on the TransLink network. Over $700 worth of offers and discounts to use at more than 80 destinations. An 80 plus page passport to travel offers. This passport provides you with all the information needed to explore South East Queensland by public transport..
Opal allows you to travel on Sydney Light Rail, buses, Sydney and Newcastle Ferries, all Sydney Trains and NSW TrainLink Intercity trains between Sydney and Bomaderry, Goulburn, Lithgow, Hamilton, Dungog and Scone. You can even catch the train to and from Sydney Airport and the airport station premium surcharge will be charged to your Opal card. With an Opal card you can enjoy travel all day for no more than $15.40 per day for Adults or $2.50 on Sundays, and your weekly total cost is capped at $61.60 (all caps exclude the Sydney Airport surcharge). Go card is TransLink's South East Queensland electronic ticket. It allows you to travel seamlessly on all TransLink bus, train, ferry and tram services in the Go card region. It's easy to use - simply touch on at the beginning and touch off at the end of each trip onboard your bus or ferry or at your train or tram station. Your go card will automatically calculate and deduct one overall fare. Go card is easy to top-up at your choice of any 7-Eleven store, a retailer near you or register today for online or phone top-ups. You can also travel to or from Brisbane Airport and the premium surcharge fare will be charged to your Go Card. Metrocard is the most convenient way to travel on Adelaide trains, trams and buses in the Metrocard region. 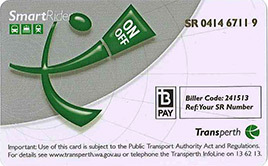 SmartRider is a reusable smart card, which allows easy, hassle free travel on Transperth train and bus services in the SmartRider region. SmartRider gives you a discount of 15%-25% off standard fares.